Director: Michael Shelton / Writer: Brian Patrick O’Toole / Cast: Eric Peter-Kaiser, Sam Skoryna, Michele Morrow, M. Steven Felty, Tiffany Shepis, Billy Morrison, Noel G, Lynn Lowry, Nathan Bexton. 11 years ago, the cops caught young psycho slasher Jack Riley, who went from town to town hacking up families with a machete during thunderstorms, after he failed to get his last victim, Karen. Now, he’s been released thanks to an easy sentence and is picking up where he left off, amid flashbacks to his troubled youth when his out-of-her-tree mom used to electrocute him for reasons the script doesn’t really go into much. Karen teams up with luckless rookie cop Chris to try and suss out his next move, while his superiors bark orders and ignore what she knows about the case in favour of the usual errors cops make in these flicks. Meanwhile, Jack hangs out in basements of various homes and offs the family members who wander around carelessly. In this film though, the victims are pretty much cameos, they’re rarely allotted more than a few lines of derivative dialogue before getting skewered with Jack’s blade. Eventually, he winds his way to the cop shop to raise the body count significantly and what was acceptable slasher film stuff goes a bit CGI-crazy with an unlikely double-scalping with one swipe of a machete, the lopping off of an arm and a disembowelment. Is he after Karen, ticking off an outstanding name from his list? Who knows, but she keeps getting in the way. 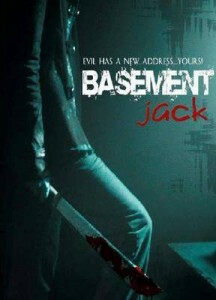 With a higher than usual budget for this kind of fare, Basement Jack is a lot better than it looks, with decent production attributes to its name and an interesting angle for the killer to act more like a serial murderer than a cut-up-everything-in-sight 24-hour sorta guy. However, it gets a bit dumb the longer it goes on and there’s an annoying thing occurring with a background character. A once over affair but not a bad one. Tiffany Shepis turns up as one of the cops in a marginal but effective role. Blurbs-of-interest: Shepis was also in Home Sick, Bloody Murder 2, Dead Scared, Scarecrow, Victor Crowley, and has a cameo in Detour; Nathan Bexton was in Psycho Beach Party. Assume you mean the building manager. He’s from the writer’s previous flick Evilution. It, Basement Jack, and presumably any other horror films he may write are set in the same universe. I have absolutely no recollection now! What was he up to? I have no idea, and neither does anyone else (besides the writer, that is). Going by that phone call he was shown making (while covered in blood, no less) and the glimpse of his “collection” at the end, the best theory put forward is that he’s a supernatural being (he does survive being impaled, after all) or is working with one.